One of the most important foods of the Mediterranean Diet Pyramid is olive oil. Olive oil contains a high proportion of unsaturated fatty acids. These fatty acids seem to be more effective in reducing LDL cholesterol, the so-called "bad cholesterol". High levels of the LDL cholesterol are associated with the long term occurrence of cardiovascular diseases. Furthermore, vitamin E, which is an important nutrient of olive oil, has a significant antioxidant action, protecting our bodies from harmful substances, which-for example- are triggered by smoking, air pollution, etc. 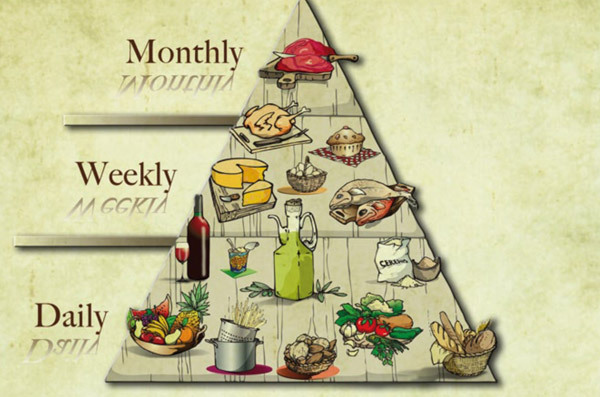 The main characteristics of the Mediterranean Diet are illustrated schematically in the Food Pyramid. The Mediterranean Diet is rich in fruits and vegetables and includes pasta, bread, cereal, rice and potatoes, poultry and fish, dairy products, some very little processed foods and little red meat. At the base of the pyramid there are grains, mostly unprocessed (whole grain bread, pasta, rice). As far as the potatoes are concerned, according to new data, they may be associated with the risk of developing diabetes type II so weekly rather than daily consumption is recommended. But it includes two key ingredients: Olive oil, which is the main source of fat, and wine. The daily intake of dairy products is mainly in the form of cheese or yogurt. The sweets are consumed a few times a week, and sometimes honey is consumed instead of sugar. Red meat is almost forbidden and consumed a few times a month and in small quantities, as opposed to chicken and fish, which are consumed every week. Wine consumption is very frequent as well (one or two glasses of wine every day). The nutritional value of fish is highlighted, because of its content of omega- 3 fats, which act energetically on the cardiovascular system. The Mediterranean Diet significantly reduces the likelihood of cardiovascular disease and consequently of coronary heart disease, since the fat comes mainly from olive oil and fish. The total intake of fat in the Mediterranean Diet, is up to 40 % of the total energy intake, but this doesn’t increase the risk of coronary heart disease. This confirms the view that the risk of coronary heart disease is associated with the type rather than the total intake of fat. The Mediterranean Diet also reduces the risk of arteriosclerosis, because it reduces the concentration of glucose, insulin and bad cholesterol (LDL). Olive oil, a key ingredient of the Mediterranean Diet exerts beneficial effect on the most common types of cancer, including breast and prostate. A study of the Oxford University shows that olive oil also reduces the risk of colon cancer. In conclusion, we would say that olive oil compared with other types of oils is the best choice for our dishes, since its beneficial properties ensure the taste and health of the consumer.